In honor of Jeanne Coverdale, the founder of Block Party Studios, we are happy to introduce our newest pattern called "Ribbons of Hope". 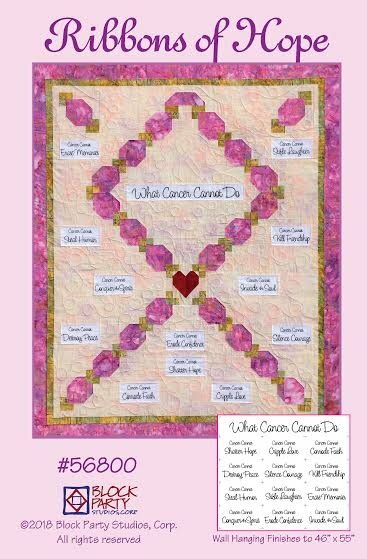 It is used with our "What Cancer Cannot Do" panel that was one of the last panels Jeanne designed before she lost her battle to breast cancer. We designed this quilt to honor not only Jeanne, but our friends who are survivors, and also everyone who are still fighting cancer, especially the young. Block Party will donate a portion of all sales of this pattern and panel to "St. Jude" hospital. With HOPES that there will be no cancer someday.